Shirley A. 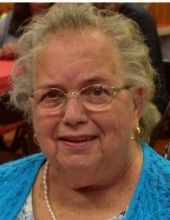 (Sabatini) Martel, 78, of Pascoag, passed away Thursday, September 13, 2018 at Overlook Nursing Home, Pascoag. She was the loving wife of the late Robert J. Martel. Born in Pawtucket, she was the daughter of the late Reno and Mildred (Oldrid) Sabatini. Shirley worked as a medical secretary for the former Pawtucket Memorial Hospital for 15 years, retiring in 2000. Shirley is survived by one son: Robert "Bob" Martel of Harrisville; a daughter Teresa "Terri" Bisson and her husband Marc of Pascoag; a brother Richard Sabatini of Pawtucket; two sisters: Linda Gardner of North Providence and Donna Gouin of North Smithfield; five grandchildren: Christine, Matthew, Jonathan, Ellie and Jared; and seven great-grandchildren: Mia, Tiana, Samantha, Tenleigh, Jayden, Jaymes and Scarlytt. She was the mother of the late Michael Martel, and sister of the late Reno, William, Ronald and Thomas Sabatini and Lilian Hughes, Nancy George, Mary Goyette and Marilyn Hoyer. Her funeral will be held on Monday, September 17, 2018 at 10 AM from the Boucher Funeral Home, 272 Sayles Ave., Pascoag with a Mass of Christian Burial at 11 AM in St. Joseph's Church, 183 Sayles Ave., Pascoag. Burial will follow in St. Patrick's Cemetery, Main St., Burrillville. Calling hours will be Sunday from 4 to 7 PM. To send flowers or a remembrance gift to the family of Shirley A. Martel, please visit our Tribute Store. "Email Address" would like to share the life celebration of Shirley A. Martel. Click on the "link" to go to share a favorite memory or leave a condolence message for the family.